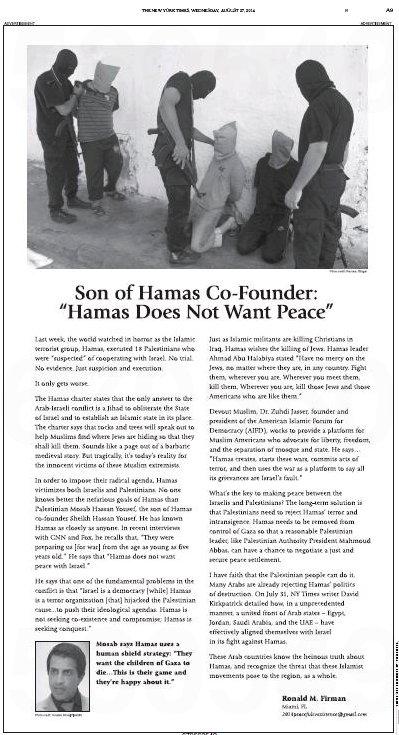 For the second time in a month, Ronald M. Firman of Miami, FL has purchased a full-page ad in the New York Times to air his sentiments about Middle East affairs. Let the wild rumpus continue. This entry was posted in Uncategorized and tagged Ahmad Abu Halabiya, Anthony Farhat, campaignmoney.com, Curt Clawson, Hamas, Israel, Martin Burns, Middle East, Mosab Hassan Yousef, New York Times, OpenSecrets.org, Paige Kreegel, Roll Call, Ronald M. Firman, Skeikh Hassan Yousef, Trey Radel, Values Are Vital. Bookmark the permalink. “…Americans who are like them”?